In Tens or Better video poker, players must draw at least a pair of 10s in order to earn a payout. This is one of the simplest variations on the ever-popular Jacks or Better format, and so it is very easy to learn. Here, we will show you what separates the two styles and how you can get the lowest house edge when playing real cash Tens or Better online. Our recommended Internet casinos stock dozens of electronic poker variants, including All Aces, Deuces Wild, Joker Poker, and Double Double Bonus. For the best Tens or Better games on the Web, we strongly suggest Royal Vegas Casino – our top-rated Australian gambling site. Enjoy over 500 Microgaming casino titles for PC and Mac, as well as mobile video poker for iOS, Android, and many other smartphone and tablet devices. And if you sign up at Royal Vegas Casino via our page today, you’ll be eligible for up to AUD $1200 in free bonus credits. This is a classic, no-frills adaptation of the traditional land-based Tens or Better video poker machines found at brick and mortar casinos the world over. Coin sizes range from $0.50 to $10.00, and there is a whopping 4000x jackpot on the royal flush when you play the recommended five coins per hand. This multi-play version is ideal for players who want more action in less time, as it allows us to take on four hands at once. It uses the same standard pay-scale as Microgaming’s single-play Tens or Better game, but all bets are automatically set to five coins per turn. Hi-stakes gamblers will love the fact you can bet up to $100 each round, while the four-hand Power Poker format means you always feel like you’re in with a chance – even on the weakest of hands. 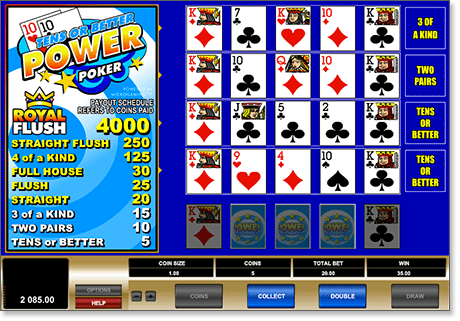 Tens or Better poker follows the exact same five-card gameplay structure as Jacks or Better and most other forms of Internet video poker. The key difference here is that the lowest paying hand is a pair of 10s, whereas in most other variants you must hit a pair of Jacks or higher in order to collect. This means we are more likely to draw winning combinations than in Jacks or Better poker – a fact that will appeal to players who get bored or frustrated during long spells between payouts. If this were the only discrepancy between the two formats, then Tens or Better would be far and away the more popular game. However, there are two significant alterations to the standard Jacks or Better payout scheme which rather mitigate the extra winning hands on offer in Tens poker. Take a look at the chart below. Note that all payouts listed are for each coin wagered, presuming we bet five coins per turn (as is standard practice in video poker). For example: a royal flush pays 4000 when you play five coins, which equates to 800 for 1 (4000 ÷ 5 = 800). Pay particular attention to the returns for full houses and flushes. Where Jacks or Better offers 9 for 1 on the full house and 6 for 1 on the flush, standard Tens or Better machines only cough up 6 for 1 and 5 for 1, respectively. This short-changing has an acute effect on the overall house edge, raising it by some 0.40 per cent – nearly double the casino’s mathematical advantage in 9/6 Jacks or Better (0.46 per cent). Follow the strategy guide below to ensure the highest possible theoretical returns when playing real money Tens or Better video poker. When dealt your initial five-card hand, simply choose the highest-ranked play available. Note that high cards refer to 10 through Ace. “Three to a straight flush” hands are ranked according to the ratio of high cards to gaps – e.g. a combination with two high cards and one gap will take precedence over a hand with two gaps and one high card. Most Internet Jacks or Better games, such as the Microgaming versions found at our trusted AUD video poker websites, come with a ‘gamble’ option. This is just like the feature of the same name found on many Australian pokies, where you can choose to risk your winnings on a double-or-nothing sidebet between spins. In video poker, this wager is 100 per cent fair – that is, there is no house edge whatsoever. Thus, from a strategic standpoint, there is no long-term risk in playing the gamble – especially on smaller payouts, where you can turn a small collect into a big windfall. Sign up to play Tens or Better at Royal Vegas Casino, our #1 Web casino for online video poker, where new players can claim up to $1200 in bonus money.